Belfast Botanic Gardens has a long history of cultivation and display of ferns. 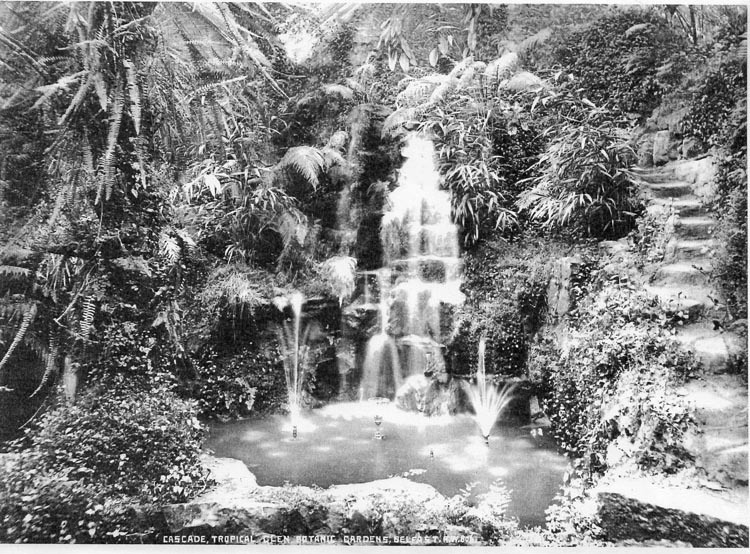 The present Tropical Ravine began as a fernery known as the Tropical Glen, which was a replacement for a previous and smaller fern house, on the site of former orchid and propagating houses. The Fernery was an extraordinarily innovative venture by the then Curator of the Gardens, Charles McKimm, who built it with his gardening team. The following quote from the Belfast Newsletter, September 11th 1889, gives the flavour of this. 'The new fernery, which has just been completed under the supervision of Mr. McKimm, by whom it was also designed and carried out in every detail - mechanical as well as botanical - will, we are inclined to think, come as a pleasant surprise to those of the public who have not been led by curiosity to investigate before now the secrets that lay hidden beyond the little door which might have been noticed in the wall at the end of the avenue opposite the bandstand. Few persons could have imagined that within the space of a few months the tiny fernery which Mr. McKimm built some years ago could grow into that wonderful landscape under glass which appeared last evening glowing beneath the subdued illumination of hundreds of Chinese lanterns and countless fairy lamps of all tints. Further praise appears in the same paper dated December 29th 1897, nine years later. The article describes a visit by a group of horticultural visitors from 'Southern Counties'.